This was a great box! The stuff I can't use already has new homes. So glad that you know of someone who can use the bookmark! It was a great box again! Looks like such a fun box. I can't wait to get mine! thanks for the mention and link! 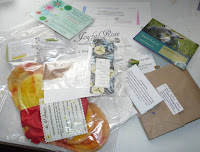 i loved the box this month and blogged about it too! My husband has also discovered the joys of exfoliating.